I am a bit absorbed with Legend of the Blue Sea nowadays. I saw Hera Cushion being used by Jun Ji Hyun and I am curious how good that product is! I have also started liking Lee Min Ho, lol. Anyways today I am reviewing a K-Beauty product. Yes K stands of course for Korean! 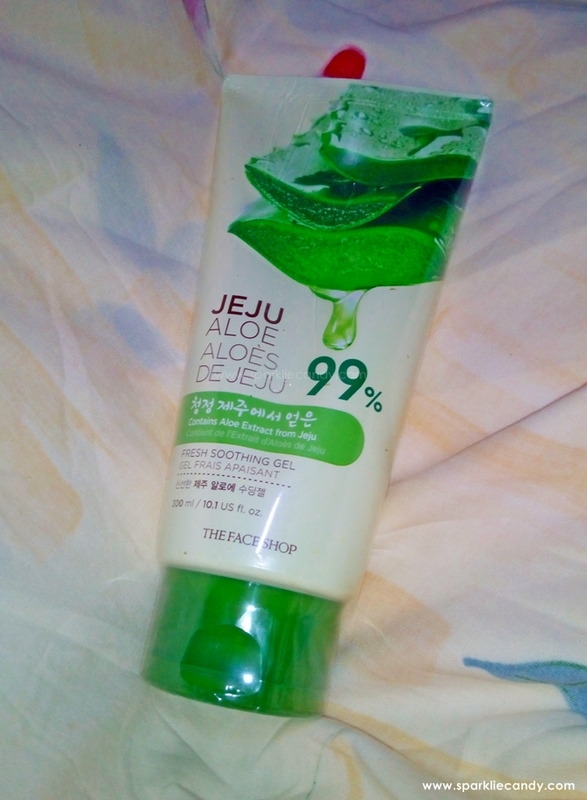 I do not usually buy from The Face Shop because I thought their stuff is pricey, however I like their THEFACESHOP Jeju Aloe Fresh Soothing Gel so I dropped by last December. I saw good bb creams and cushions with the same prices with Tonymoly and EtudeHouse. I guess this gives me more options on korean beauty items then. Formulated with 99% Aloe Vera Leaf Extract from Jeju to soothe and moisturize the skin. This gel can be used for various purposes including moisturizing, soothing, facial pack and after-sun care. As Aloe Vera Leaf Extract is absorbed into the skin without leaving any sticky residue behind, it soothes and moisturizes at the same time. 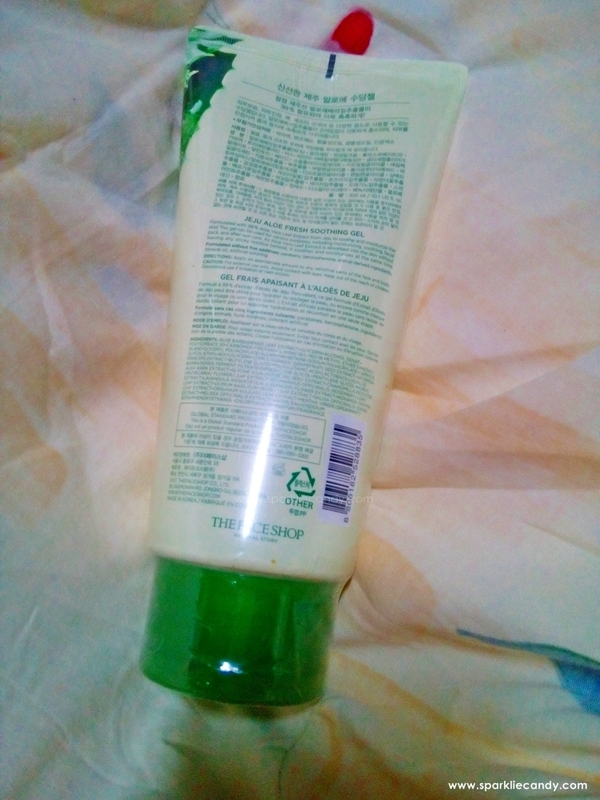 Originally this was in a big green tub like the Nature Republic one. However after being out of stock for a while it came back in a new packaging! Now its in a big plastic tube which is more convenient and sanitary. No double dipping! My skin is micro peeling nowadays and THEFACESHOP Jeju Aloe Fresh Soothing Gel does a good job as it soothes my skin when I apply it on. It has this kinda cool effect but don't get me wrong its not the 'minty' cool effect though. 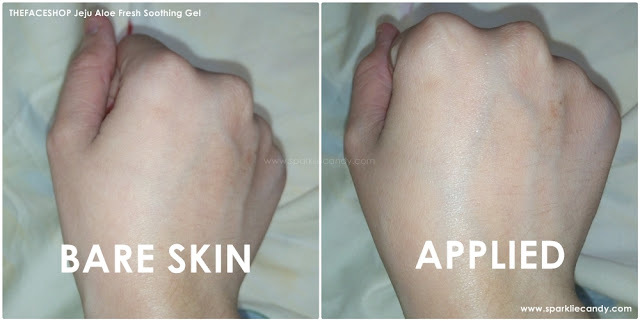 The gel is simply refreshing on the skin. I used Jeju Aloe Fresh Soothing Gel to moisturize my face after using my Micellar Water. Its best applied by hands, I just tap tap and massage it on my face. My skin kinda looks supple after application. The reason is, it doesn't get absorbed very quickly by my skin so it settles on it for a while. It have the usual scent of Aloe Vera. Its really all natural and contains 99% aloe vera, the highest percentage I've seen among the other korean brands. As you can see the part where I applied the Jeju Aloe Fresh Soothing Gel looks glowing and supple. P195 for a big tube, I bought mine at The Face Shop in Makati. This is my 2nd purchase, so its a yes! THEFACESHOP Jeju Aloe Fresh Soothing Gel is all-natural, affordable and does the job. I recommend this for all types of skin types. Its very gentle and I bet will work even for sensitive skin. Big thumbs up for Thefaceshop. I might buy more items from Thefaceshop next time, anything you might want to recommend or any reviews you want to see? Let me know in the comments! Do you use it on your face? I'm very much interested because we're both Pinay 😊 Thank you. I bought mine in Seoul during my trip there last month. I was forced to purchase the product because the skin on my face became soooo dry mainly to the cold weather and sun exposure. My skin found relief from tightness and itchiness upon application. However it was only temporary, I need to re-apply several times during the day, and once before I go to sleep. When I got back from Seoul, this product became very useful yet again as relief again due to the extreme heat. Can this product help in minimizing the appearance of your small pimples It's been days since I've been dealing with my small pimples and bumps around may forehead and chin �� and also is this better than Nature Republic? Thanks! what do you prefer among the two ? nature republic or thefaceshop? ano difference? I was looking for a mosturizer, i already can feel the changes on my face, sign of aging maybe�� im not using any facial beauty products before, just soap. i'll give this a try�� what other products you guys can recommend? 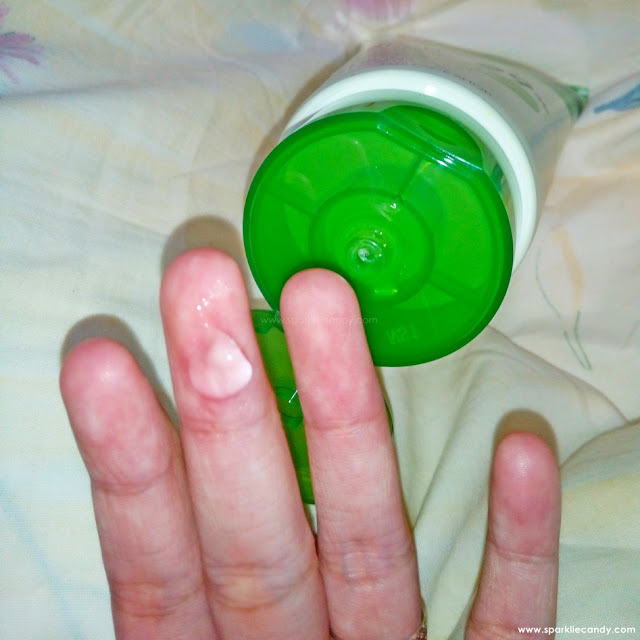 Hi chien, i was wondering if this jeju aloe vera shoothing gel Can also heal like pimple, acne or darkspot? Is it okay to have like a facial cleanser first before applying the jeju aloe on my face?